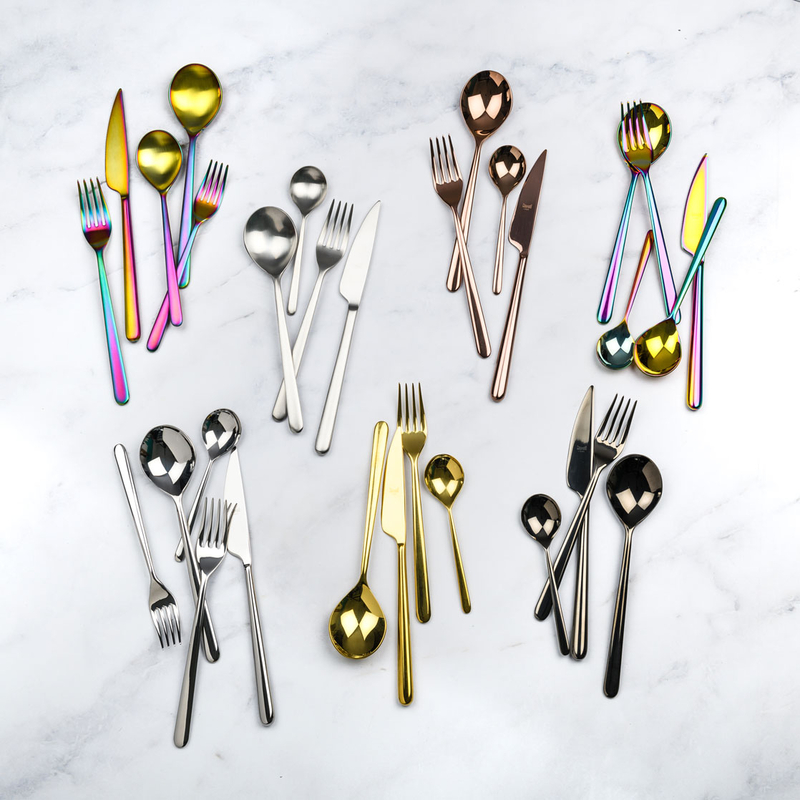 The Titanium collection by Mepra is flatware that exudes luxury as a lifestyle. It is inspired by influential designers like Angelo Mangiarotti and exalted through generations of tradition, technique and superb materials. They're quite practical too. The metal undergoes a titanium-based molecular embedding process that makes for dishwasher-safe utensils that won't corrode, oxidize or stain. Today Mepra products appear on the tables of the most prestigious hotels in the world, renown and multi award-winning restaurants and hundreds of thousand of people’s homes. 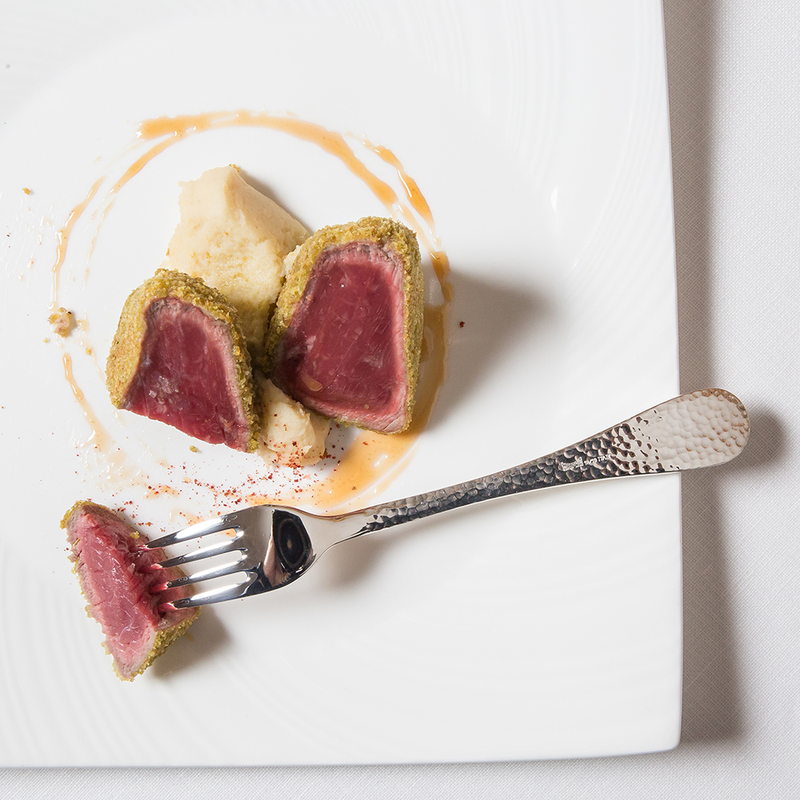 With our new online store you can now easily bring a piece of Made in Italy history to your table. 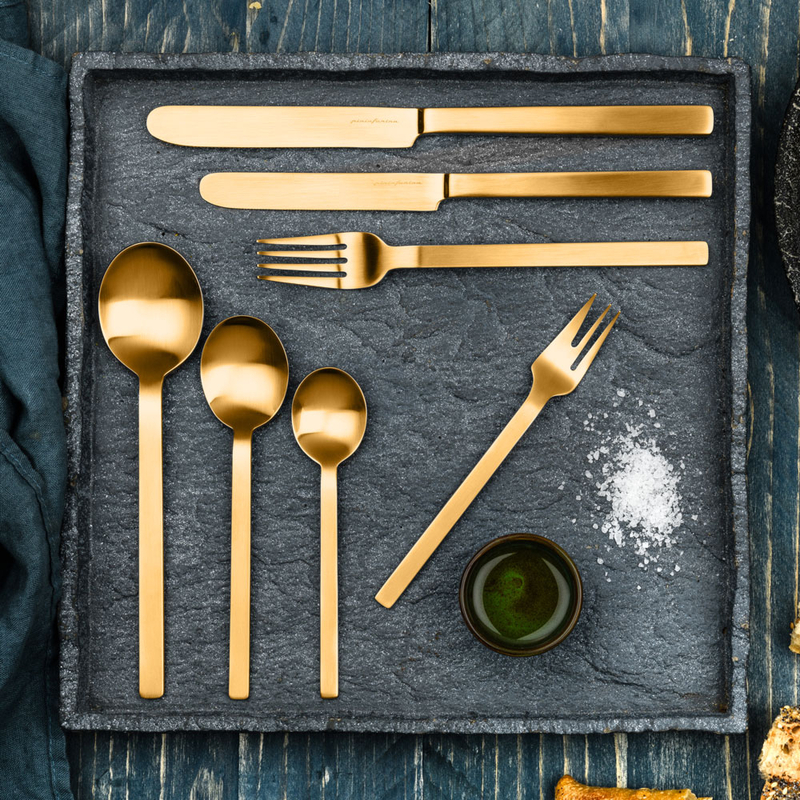 Mepra Titanium flatware is available in 6 different colors: Oro (gold), Oro Nero (black gold), Bronzo (bronze / copper), Champagne (Silver), Arcobaleno (rainbow) and Stainless Steel. And its available in polished and brushed version. The Luxury Art by Mepra, is the new brand, born from Mepra's historical experience. Our designers have taken over, studied, and developed old engravings of precious objects, rich textures, and fabrics, related to contemporary art reproductions usually seen in the world of fashion.These designs have been reproduced with refinement in the new collection of The Luxury Art by Mepra, where we find them turned into objects for the table. Substantially thicker gauged stainless steel, fork prongs are inside-machined for lifetime performance, knives with finely tooled serration for effortless cut. Dishwasher safe. Mepra solid experience and Pininfarina constant aesthetic research have created a flatware collection in the pursuit of timeless values: Beauty, Purity, Innovation. With its contemporary, essential look, STILE brings elegance without forgoing functionality. The pureness of the lines and the clean, essential geometries shape a collection in which function and style reach the perfect balance. Not only stylistic research, but also attention to safety, ergonomics and functionality, make STILE an expression of the highest Italian quality and the proof of an innovative approach to design, focused on people’s wishes and needs... now awarded with a 'Red Dot Design Award'. Studio Tecnico Mepra re-interpreted the Neo-Baroque style to create a collection of elegant and refined, yet modern and balanced shapes. 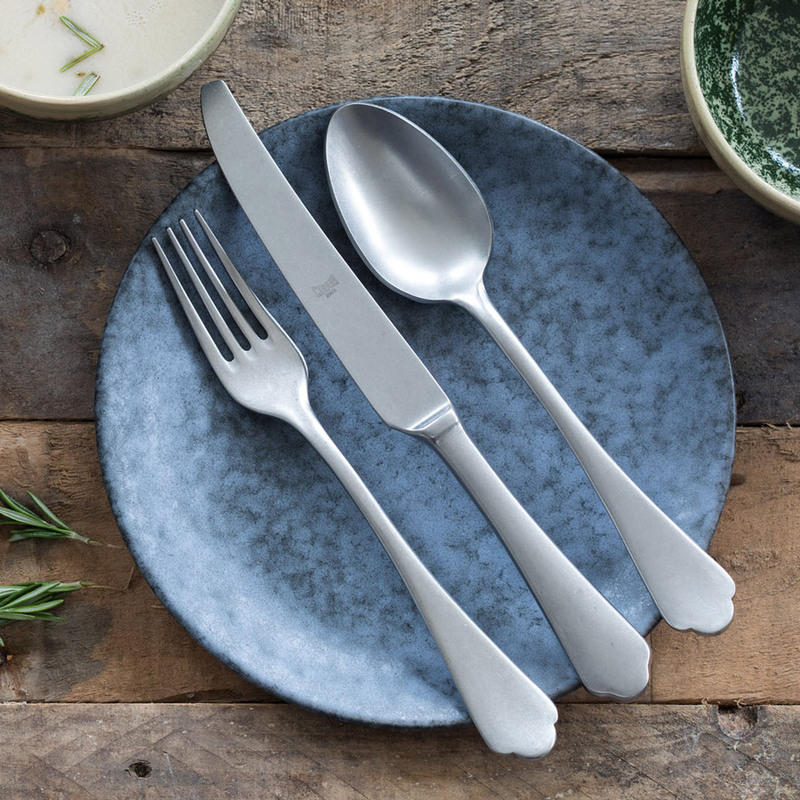 The pewter titanium finish adds a stylish distressed and unique look to each piece that will surely enhance your table. Substantially thicker gauged stainless steel, fork prongs are inside-machined for lifetime performance, knives with finely tooled serration for effortless cutting. Dishwasher safe. Mepra presents a new range of flatware: EPOQUE. Epoque combines classic and aristocratic design with innovative textures. 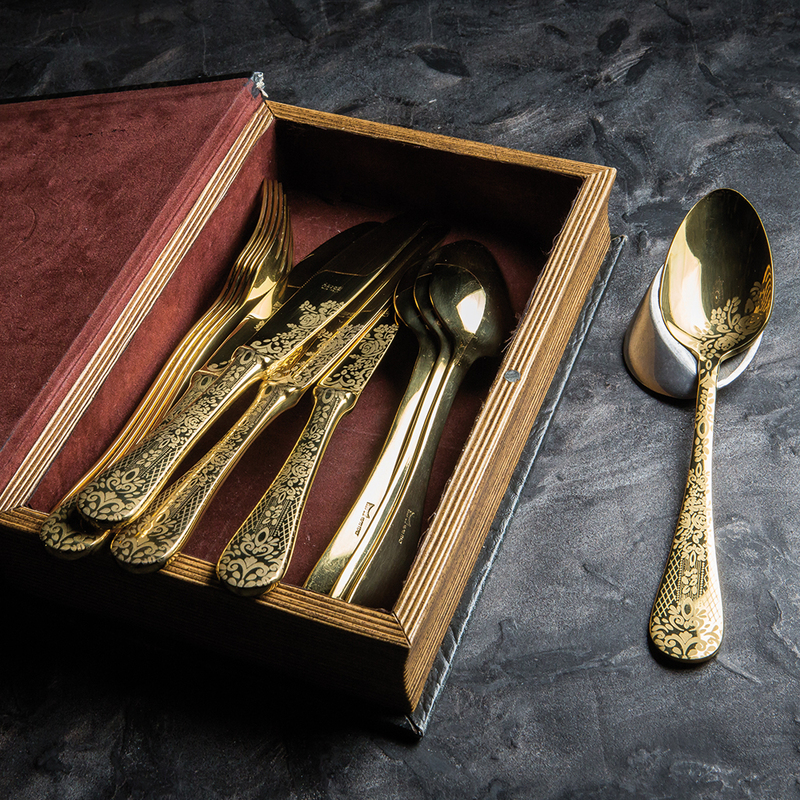 Our new Epoque flatware is available in Oro (Gold), Oro Nero (Black Gold), Bronzo (Bronze), Champagne (Silver), Arcobaleno (Rainbow) and Stainless Steel. And it is available in 3 different finishings: a polished, brushed or pewter version. A multitude of possibilities to find the best option to give your presentations. Watch our video with a selection of the best models, finishings and colors. If you have any questions, don't hesitate to contact us.